The digital revolution is here to stay. Many products vanished from the shelves to be in our hard drives. Books, music, photos. In addition, many of our old appliances became apps. Calculators, watches, spreadsheets, notebooks. Even services or entire experiences are digital as well, such as courses or chatting with friends. Clearly, the businesses were affected as well. You’re wondering if it’s worth creating digital products, or if they even have a place in your market. And it’s almost certain that this is the case. Not just because many products are downloadable now, but also because customers are expecting it. And they are willing to pay for the convenience. As Steve Jobs discovered by creating the iTunes store, convenience is very much worth it. Now you may be thinking that the entire structure for building an online store is too much. Thankfully, we have WooCommerce virtual products as an option. WooCommerce itself is a great plugin to turn a WordPress site into an online store. But it has by default digital products options, which can be used for a quick deploy of your digital store. Thus, when you create your products you have the option to add shipping details and download details. This means that you can have downloadable products on top of physical products. For instance, you could sell your latest album, and along with a physical CD, you can send a download link. The same goes for posters, books or even instruction manuals. On the other hand, this means that you could sell virtual products that are or aren’t downloadable. Non-downloadable products are usually services, memberships or even pre-sales. Additionally, the virtual products can be used for donations and crowdfunding campaigns. As for virtual downloadable products, they are the pure digital products. If you want to sell digital products in WordPress, it may be a good idea to make them feel tangible. In terms of business strategy, downloadable products are a hit. Their marginal cost is almost zero. This means that the production costs for one copy or a hundred copies or an eBooks is the same. All your efforts are focused on the two ends of a sale, production, and marketing. This may seem like a small distinction, but when we cut out the logistics costs, your reach is unlimited. No matter where your customers are if you can provide them value, you can sell your product. However, often digital products work well as part of a bigger strategy. Apple sells apps, songs, and tools for their own ecosystem. There are many WordPress plugins, themes, and tools you can buy. Free products could come with paid upgrades. There are success stories on each strategy, and it all begins with the development and sale of a digital product. Let’s quickly create our first downloadable virtual product with WooCommerce. Go to WordPress Dashboard > Products > Add new. Add your product details and make sure to check the virtual and downloadable options. 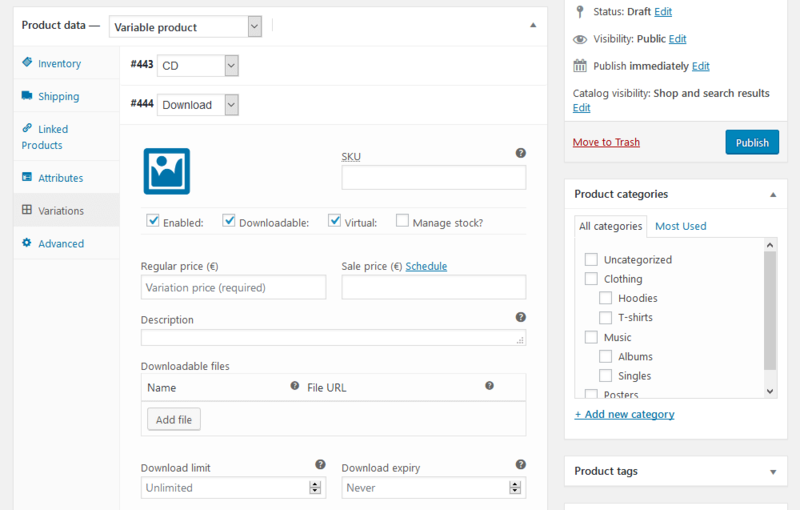 Then add your product details, such as price, download limits (if any), expiration date. 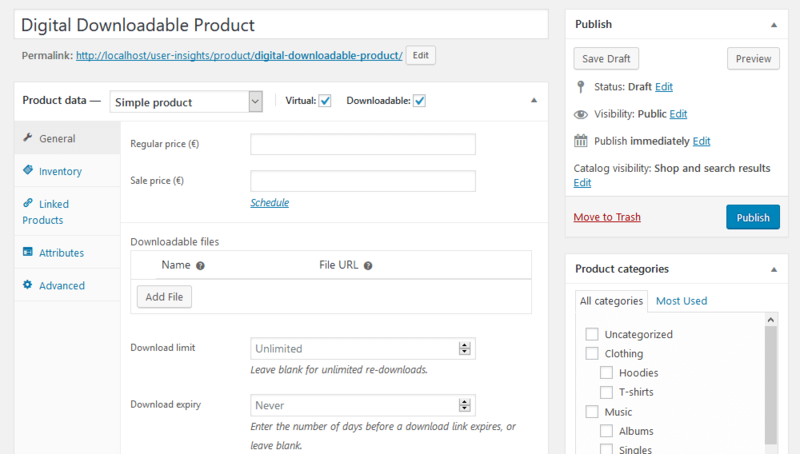 You can add as many download files as you want for your products. If you want to sell digital products in WordPress, it may be a good idea to make them feel tangible. For instance, you could add a 3d style box for a software. You could add a nice cover design for your eBook. Even something as simple as a thank you note in your downloads can give customers a better feel. The more countable items (even if digital) they get, the better. Occasionally, we may need to sell different variations of the same product. For instance, let’s say you sell digital media online, such as music. It’s very common to need different licenses or different variations of your product. If you want to sell the physical and digital versions, for example, you could do that. This is done using the WooCommerce variable product. When you create a variable product, you can, in fact, have multiple products inside of it. You can even have digital and virtual variations of regular products. 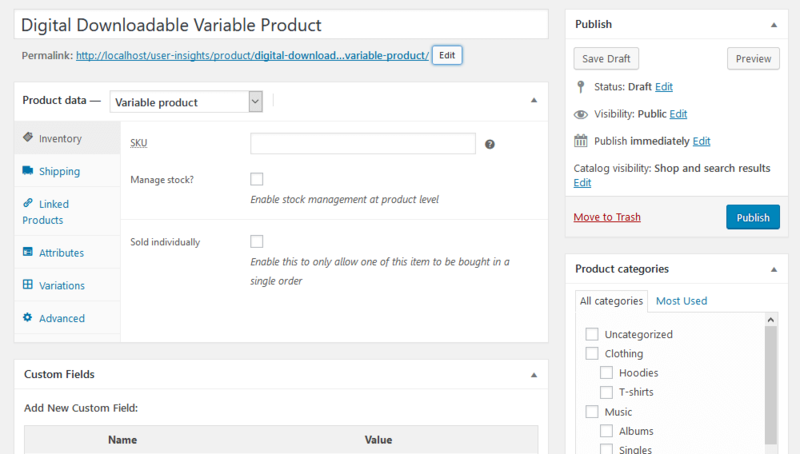 When you are creating your product, select Variable product in the Product data tab. Then, under the attributes tab add the different versions you have for your product. You can use Licensing, media type, packages, and many other variations. Make sure to select the “used for variations” box. And then, under the variations tab add the different variations you want. When you create a new variation, you can select the attributes of a simple product for it. This means that one variation can be virtual and downloadable, while others aren’t. Likewise, if you want to sell digital products in WordPress that are purely virtual, this is possible. Often these are created using membership sites and subscriptions. We have a guide on how to sell your services with WooCommerce, for an in-depth view. But the short version is that the right approach depends on your business type. You could use WooCommerce, WooCommerce Subscriptions or even other plugins for membership and booking features. Specifically, with downloadable products in WooCommerce, protecting file access is crucial. You are selling your knowledge. Unfortunately, some users may try to abuse this by downloading the files directly or using it beyond its license. In particular, for the case of downloads, we came a long way. Previously, file downloads had no protection at all. In some cases, it was even as simple as guessing the download folder or the private page URL to get access to everything. Then we started randomizing file names, which was a great evolution. But once a user got the actual link they could simply share with others. Then we came to one of the solutions that are used nowadays. Some servers use PHP to force file download. This is a good fallback option and should work fine if you don’t have large files. The problem is, once you use just PHP to serve the file you may exhaust your server resources. That’s why the best way to serve files now is via the X-Accel-Redirect/X-Sendfile module. This is a module that is included in a lot of hosting providers. With it, you have the safety and performance. Only authenticated users can download, and yet your server won’t be exhausted. The downside is that if this tool isn’t available in your shared server, you can’t install it on your own. In order for you to maximise your digital sales efforts, it’s vital that you understand the basics of how your digital downloads store performs, analyse customer retention data, and use that information to improve sales performance over time. Analysing your data gives you valuable insight into the inner-workings of your business. Users Insights will automatically pull in data from your WooCommerce store and provides powerful dashboards and reports, without all the manual inputting and analysis work on your part. Since our digital products can be sold around the globe, it is interesting to check how global you are getting. For example, you can filter out all users from your city or even your country. This shows you how many orders you have from abroad. In addition, if you want to repeat this search often, you can save it as a segment. The segments tool saves your current search for later use, and it can be applied with a single click. It could be something as simple as the country, or it could be a complex filter such as considering the number of orders and lifetime value. Today we looked into how to sell digital downloadable products with WooCommerce. We went from the basics of your strategy to the actual implementation. By the end of the day, you should be able to create your products and even set up licensing restrictions. We hope you enjoyed, and see you again next time!